Let&#146;s just get this out of the way: the book is better. Shoot The Piano Player by David Goodis is a poetic, bleak story about a man who hides from his shattered life by doing the only thing he knows how to do in the most degraded circumstances possible. When his past comes for him, he can&#146;t escape, no matter how badly he wants to, and when he&#146;s pulled in, he drags innocents with him. Shoot The Piano Player, by Francois Truffaut, shares these themes, but as a French tribute to the uniquely American literary/cinematic noir genre, it makes its stylistic borrowing apparent, sometimes to its detriment. A major character&#151;pianist Eddie&#146;s baby brother, Fido&#151;was not present in the book and seems to have been added to make the plot more gripping or emotionally resonant, but this addition was a mistake. It nearly reduces the story from a study of the damage adults wreak on themselves and those around them, to a save-the-endangered-child melodrama. Eddie (Charles Aznavour) is a former classical pianist who abandoned his career after his wife&#146;s suicide. When we meet him, he&#146;s working in a crappy Parisian dive, playing a battered upright even Tom Waits wouldn&#146;t touch. Enter Chino, Eddie&#146;s older brother and a lowlife, on the run from two gangsters. Eddie must defend his brother, must rejoin the family he fled for a life in the rarefied air of classical music, even as he&#146;s just stumbling into the beginnings of the first human relationship he&#146;s had since his wife&#146;s death. His new romance is with the bar&#146;s waitress, played perfectly by the beautiful Marie Dubois. This is an interesting story, and the screenplay tells it fairly well. The film goes back and forth between scenes of crime and domesticity, and Aznavour&#146;s portrayal of Eddie gives us one of the most perfectly, terribly hollow characters ever seen on-screen. His inability to verbalize any emotion not directly related to his own desires or ambitions is simultaneously the engine which drives his life and the weight which inevitably crushes it. There are portions of the film, however, which sag unforgivably, particularly when Eddie and his criminal brothers are sitting around the table violating the cardinal rule of filmmaking: &#147;show, don&#146;t tell.&#148; There&#146;s way too much expository dialogue here. Sometimes it&#146;s a blessing, though, as half the film was apparently shot while the lighting crew was on vacation: entire scenes vanish into pools of blackness, with only the subtitles to telegraph the action. Truffaut has taken the word noir far too literally. 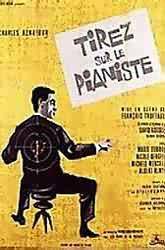 Shoot The Piano Player is an entertaining film, even though its hijacking of an American crime novel for its plot demands that the viewer accept the idea of vicious French gangsters without laughing. It&#146;s also a fascinating study of flawed humanity. Eddie tries to break out of himself, to embrace Lena, but it takes him so long just to get to the surface from the depths at which he&#146;s submerged his soul that it&#146;s far too late. The ending is pitch-perfect, and one shot in particular (a body sliding across the snow) as ideal an argument for film-as-art as anyone could ask for. But the book stakes out territory in the reader&#146;s heart that it refuses to relinquish, where the movie is, at the end of the day, just a crime thriller. As good as this movie is (and it&#146;s very good), the book is better.